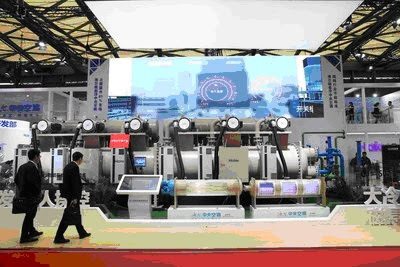 SHANGHAI, April 17, 2017 /PRNewswire/ - Haier Central Air-Conditioning(Haier CAC), a business unit of Haier Group Corporation, debuted its magnetic bearing centrifugal chiller unit with world's largest cooling capacity, 4200RT, at the 28th China Refrigeration Exhibition held in Shanghai New International Expo Centeron April 12. One unit can cool a 100,000-square-meter, a feat unmatched to date, while the Integrated Part Load Value (IPLV), the indicator of efficiency at full load conditions, measures 13.18. The new unit brings the application of magnetic levitation technology in the refrigeration sector to an entirely new level. At variance with traditional central air-conditioning, the maglev unit is oil and friction free, consumes 50 per cent less energy and has a 30-year-long service life, twice as long as traditional units. As a result of these advances, magnetic bearing centrifugal chiller is taking the front seat in terms of becoming one of the key development directions for the central air conditioning industry. Early in 2006, Haier pioneered the development of China's magnetic bearing centrifugal chiller sector and, in 2015, launched its first , rated at 2200RT, which, at the time, was the highest available cooling capacity on the market. The just rolled out 4200RT unit sets a new world record. In terms of manufacturing technology, Haier CAC built world's first factory with the mission of producing user-centric central air-conditioners that leverages the technology of interconnected devices, while combining energy-saving technology, artificial intelligence and mass customization, bringing about the transformation from mass production to mass customization and accelerating the implementation of the China Manufacturing 2025 strategy, the Chinese government's initiative for the country's leading industries to attain self-reliance for key components and to integrate innovation across all aspects of a new product roadmap.